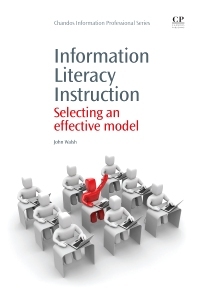 An invaluable guide for MLS professionals and students, this new book explains how librarians can select an effective method of library instruction based on their users, the objectives of the instruction and the delivery environment. The content describes the different methods available and in what circumstances the methods are most effective. It includes descriptions of curriculums for the methods currently available and describes a range of objectives the curriculums meet and the common environments librarians use for instruction. Information Literacy Instruction also introduces two new ideas for methods of instruction: one which combines information literacy with cyber-literacy (MLI) forming an instructional method appropriate for internet users and internet information and the Fully Automated Reference Instruction (FARI) that actively involves users with the instruction while completing research they are currently involved in for specific targeted classes. John Walsh has over 10 years' experience in academic and corporate libraries. He is currently a PhD. Student of the School for Information Resources and Library Science at the University of Arizona in Tucson, AZ. He has been researching the effectiveness of information literacy instruction since 2006 and currently works in access services at Cochise College Libraries in Sierra Vista, AZ.